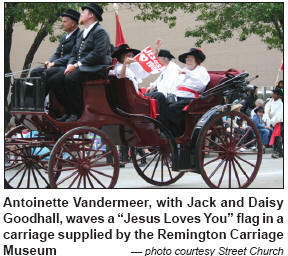 For their entry into this year’s Calgary Stampede Parade, Street Church volunteers dressed up in seventeenth century outfits (like musketeers) and with five large banners that spelled the name of Jesus leading the way, the church’s presentation involved horses, carriages and flags, along with one man dressed in red, blowing the shofar and dancing the entire parade route. Their caravan of carriages and flags was followed up by two people holding a large banner with the Ten Commandments printed on it. Over the past two years the Street Church’s entries have received opposition from parade officials, but this year things were different. “What a joy to be ambassadors for Christ in an international live telecast of The Greatest Outdoor Show on Earth,” said Street Church pastor, Art Pawlowski. 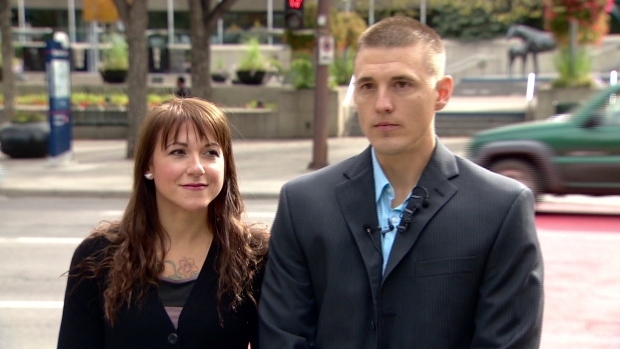 “We had an awesome response from the Stampede organizers. They thanked us for putting this together.” Visit www.streetchurch.ca.